Written by David Hagger on 14 October 2015 . Reuben Hills is a well oiled unit despite the constant business. Staff are engaging and efficient and ever helpful. Quick to take your order, then quick to see if you have further needs. The food and coffee comes out relatively quickly considering a packed house. Spot a celebrity here - apparently Toby Maguire visited Reuben Hills while promoting The Great Gatsby. Reuben Hills is famous for several menu items, which is always a good sign. 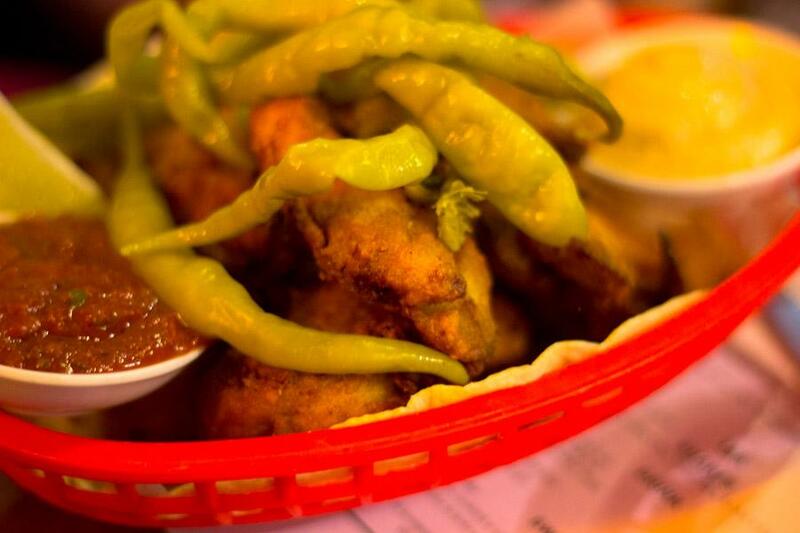 I was always going to order the Fried Chicken w chilli in a basket (comes with expletive on the menu, fair enough). This fried chicken is cooked several different ways to keep the crispy outside and juicy inside. The aoli and the chilli sauce are magnificent to accompany. 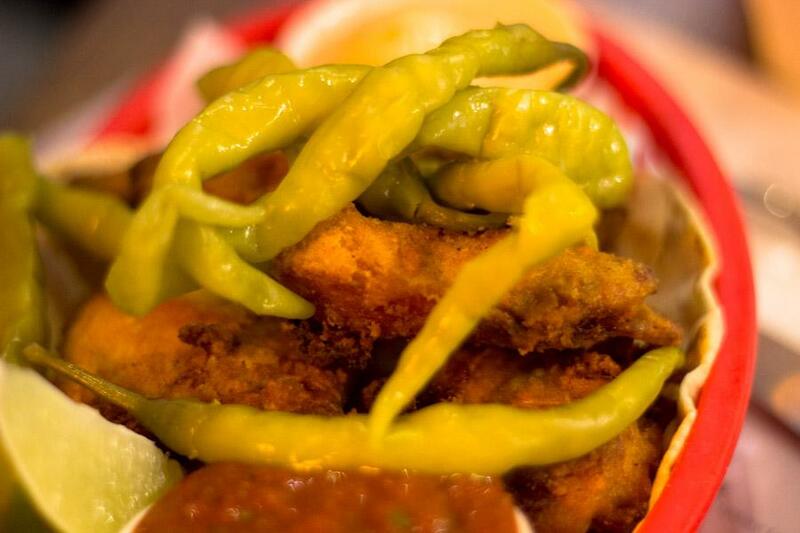 Surely one of the best fried chickens around. For those into chilli the chillis on top were a winner - as I gnawed on a few for some extra kick. Reuben Hills is also famous for the NOT reuben wagyu salt brisket, pickled slaw, manchego & horseradish cream on rye. Of course its in the mould or spirit of the Reuben sanwich, but with a twist (no corned beef, no Swiss cheese). We are talking wagyu salt brisket - which would have been dazzling just on its own - perfectly cooked prime beef partnered with the pickled slaw and kick of the manchego cheese and horseradish. The rye itself was a winner in terms of quality artisan bread. Its a hearty sandwich and I wondered why we ordered two fried chicken baskets and baked eggs in addition. We ordered another basket of the fried chicken it was that **** good. 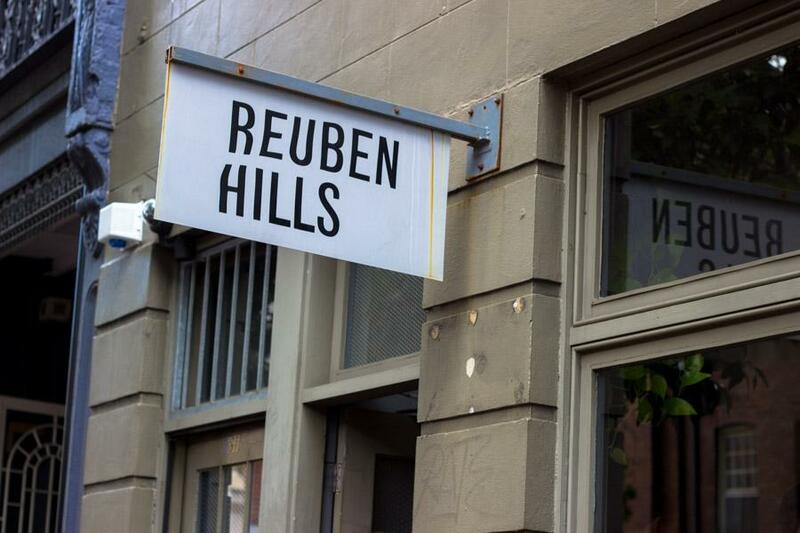 Reuben Hills had already blown us away, and that was before their amazing coffee. I may seem in superlative overdrive but it was like that. 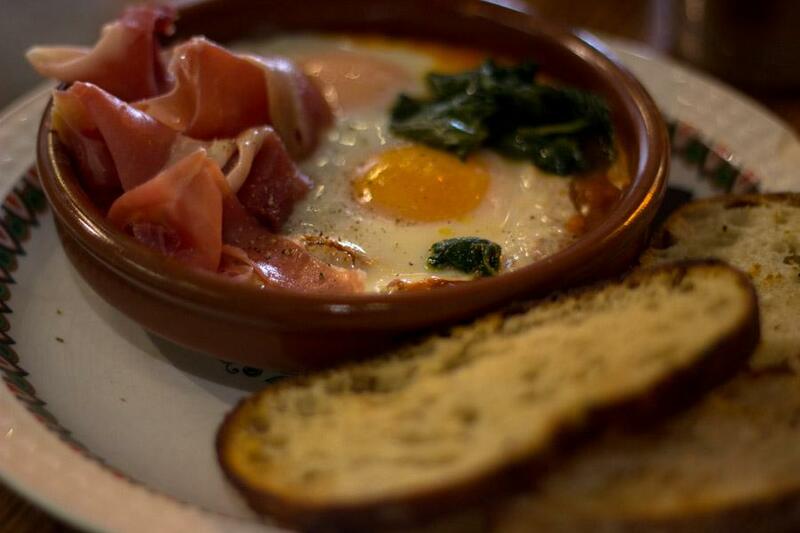 The next dish was one of the best we've had - the SOFT Baked Eggs - w jamon OR Morcilla, spinach, ranchero & rye. We chose jamon as the meat of choice. Fair dinkum, this was the best baked eggs dish we've ever experienced - and we've had a few... It was about the flavours coming together in a symphony. Sometimes baked eggs dishes can be tasteless and uninspiring, like the one I'd had a few days before elsewhere. But this knocked our socks off with perfectly cooked bacon, eggs, spinach and right amount of seasoning. 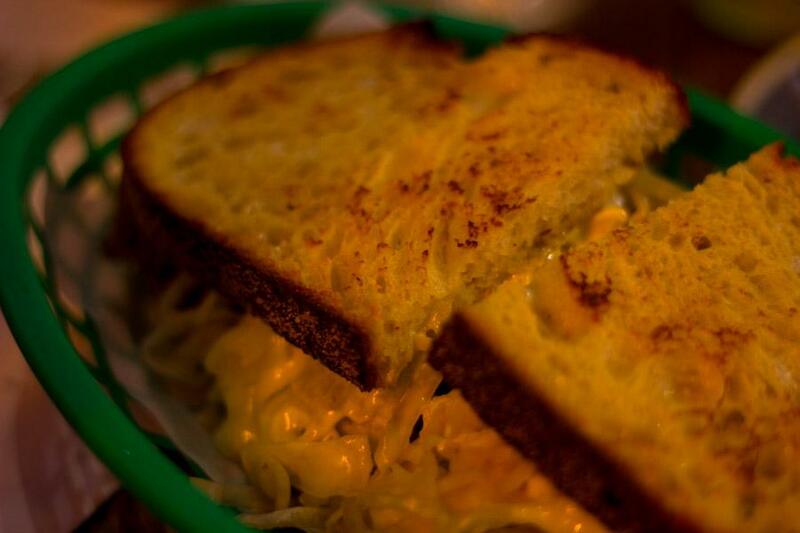 Baked egg dishes need some kick, and Reuben Hills gives it the right amount of heat. Reuben Hills pours a serious coffee. Grab a Panama Esmeralda Mario Enero 2013 (Bergamot & peach tea notes) filter or Ethiopia Yirgacheffe Kochere (Orange blossom & Jasmine tea notes) espresso of the day. I ordered a latte and it hit the mark. These guys are a serious coffee destination, winning the Latorre & Dutch best boutique roaster of 2013. Public coffee cuppings are held weekly Friday 10 am with all welcome. 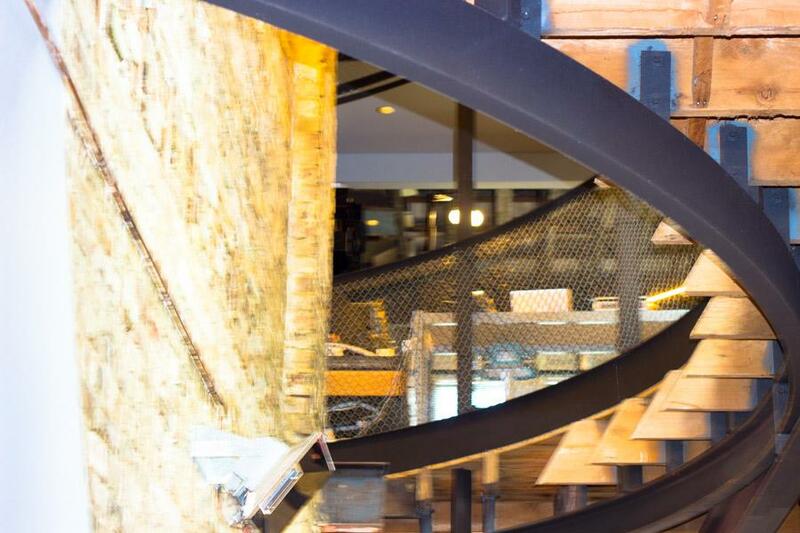 Reuben Hills has a chic fitout - check the exposed brick section of the wall and spiral staircase. 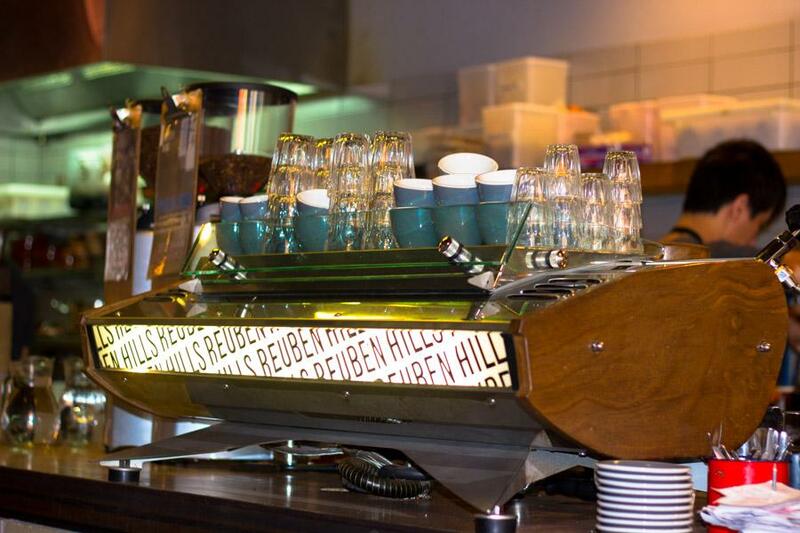 Reuben Hills is a Roastery and its heavy artillery equipment can be seen as you gaze upwards from the maddening crowd. The sense of space is enhanced with a back section opened up and roller door open. Reuben Hills is the cafe that keeps on giving. Also famous are the shakes. Choose from combinations that satiate - Salted Caramel, Espresso & White Choc, Mexican Ibarra Choc Chilli, and Lychee, Lime & Coconut. After imbibing the salted caramel shake, it was imperative to order another. The shake was alluring without being sickly. So many menu options catch the eye, for example the Franks n Beans w soft duck egg, tortilla crisps, chimmichurri, pork sausage and sour cream. Or Short rib burger w garlic ranch dressing & potato salad... Kudos for breakfast menu items being served all day. Desserts also resonate including Doggs Breakfast ice cream sandwich w salted caramel or Milhoja ‘Thousand Layers’ layered flakey pastry & dulce de leche. 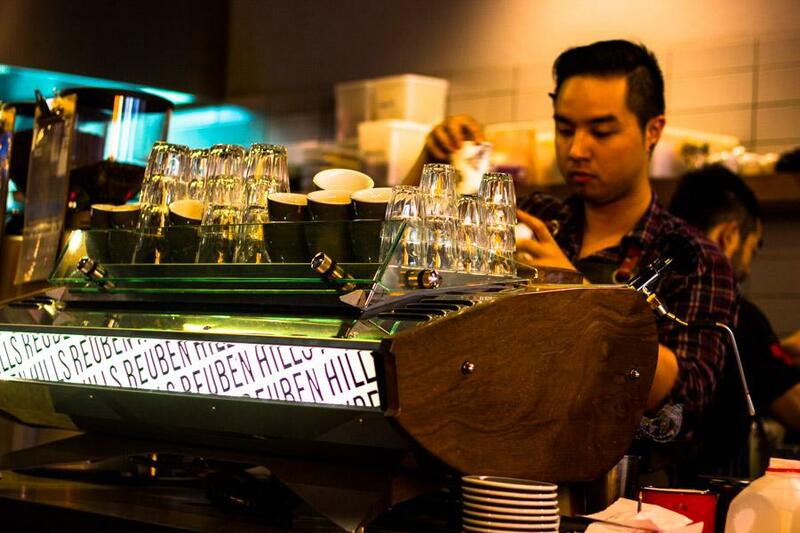 Reuben Hills is a compelling cafe in Sydney and trendy Surry Hills. I've concluded that much of the menu comes with a twist and a kick, which we love. The menu is imaginative and playful. I enjoy cafes where the coffee is amazing but the cuisine is excellent to match. These guys can bat and bowl. Service here is friendly hipster. If I had to wait another 40 minutes on a Friday morning for my next visit I would. Highly recommended. Bean Drinking is a multi award winning espresso bar that uses coffee roasted by their wholesale roasting division Roastworks Coffee Co. I'm always impressed with a cafe that has its own roastery. 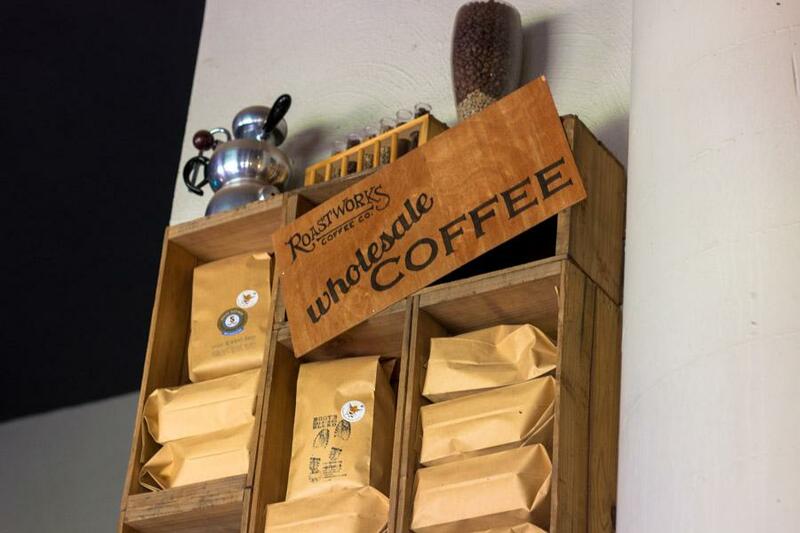 Says their website, "Located in Crows Nest, Bean Drinking opened in 2005, and our focus has always been coffee first. The response was fantastic, and we gained an instant following. Our passion and delicious coffee was 'discovered' by the local newspapers, lifestyle editors and food critics. Articles were written, awards were won, the following for our coffee grew. People came from far and wide, and we turned into a 'must visit' destination for those seeking to experience great coffee made with a passion. With a commitment to sustainability and traceability, we showcase outstanding Estate and Micro Lot coffee using a variety of alternative brewing methods in our 'coffee lab'. For espresso beverages, we utilise Synesso and Slayer Espresso machines. 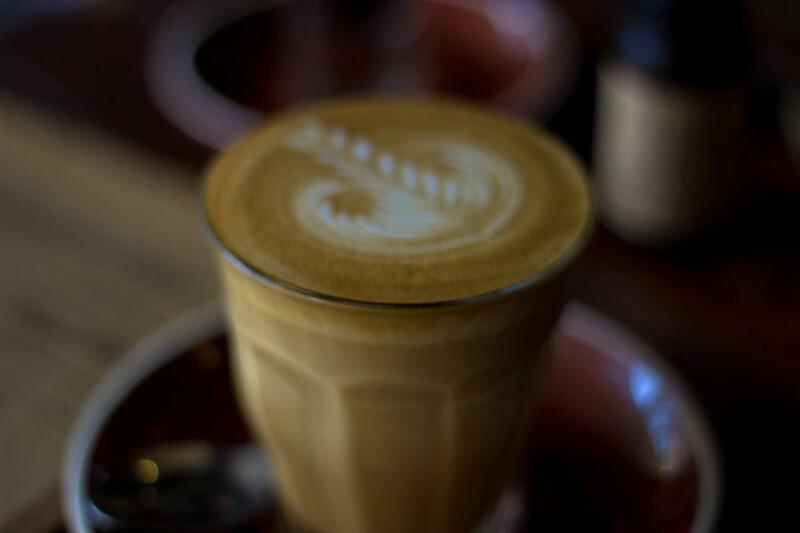 Our coffee is perfectly complemented by our espresso bar style food menu which runs all day and covers breakfast and lunch options with a focus on organic, fresh, local and seasonal produce. 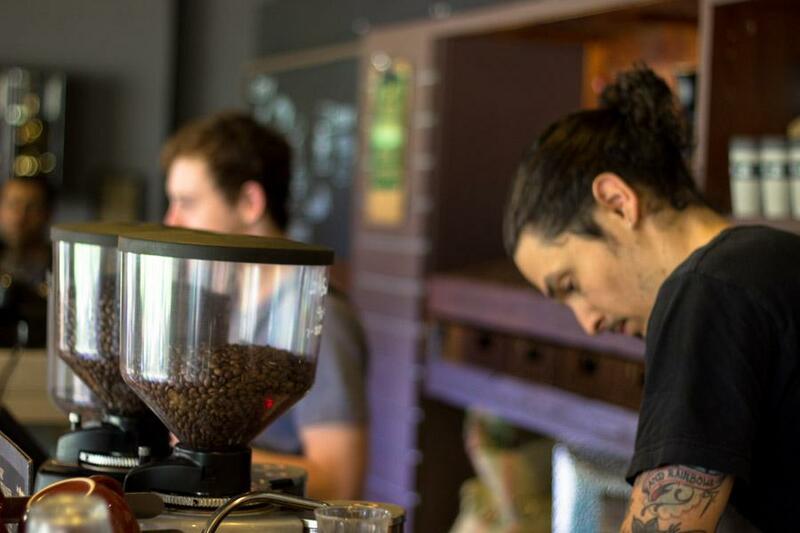 We also offer a range of retail items including Hario brewing equipment, hand grinders, and of course our knowledgeable baristas are happy to spend time discussing techniques to help you improve your own coffee making and can help you choose from our range of single origin coffees and blends to brew at home. To those of you yet to experience what we do, we say that it's never too late to visit us in Crows Nest, or you can buy coffee on-line for the home or office." 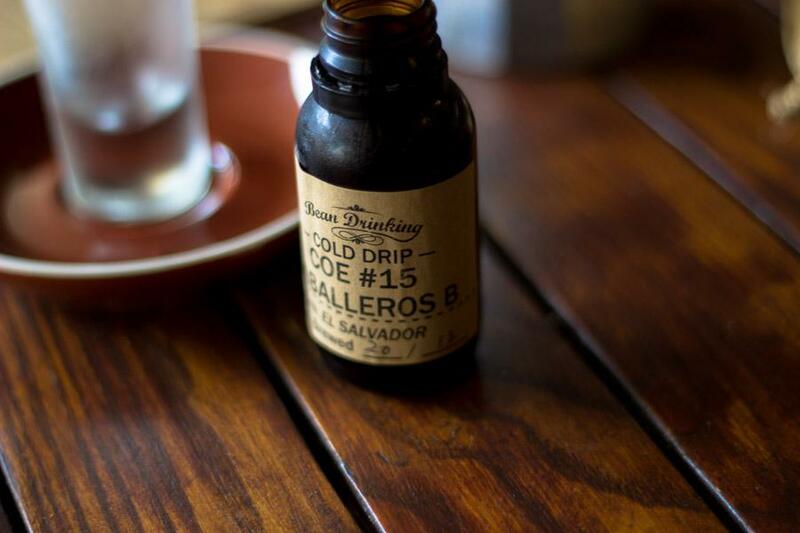 Bean Drinking serves up an appealing cold drip (below) and presentation is first class. You can grab supplies of coffee while you're here, or order online. Bean Drinking also has an impressive food menu with tasty treats such as the rewarding Breakfast Brioche. 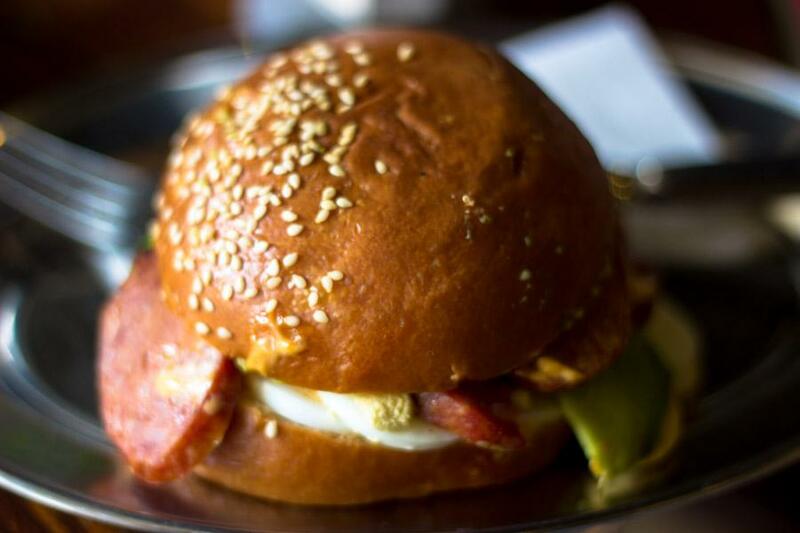 A soft brioche bun with chorizo and avocado, along with harissa mayo, feta and boiled egg is a total delight. Also check out the Reuben Sandwich.Or order Broad Bean on Toast or the Breakfast Board. 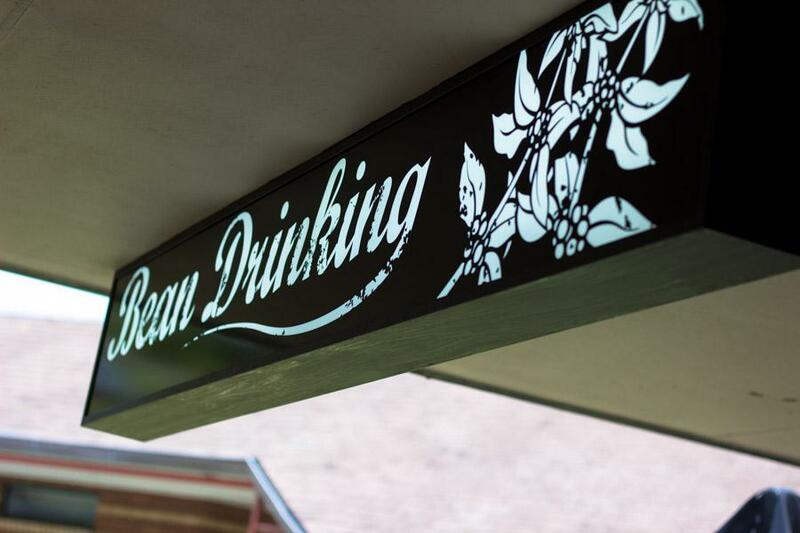 Bean Drinking has a relaxed feel and you are engaged by friendly knowledgeable staff. Love it. Highly recommended. St Jude's has a charm and allure of its own and is a compelling cafe destination in Sydney. Sometimes you want a cafe which exudes individual expression and stands out from the pack, not just in terms of coffee and food, but ambience. 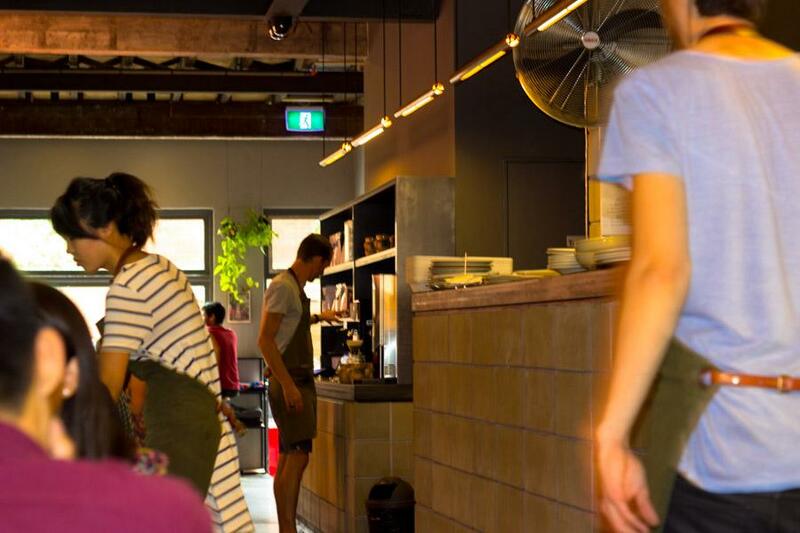 St Judes Cafe is a funky even grungy and quirky cafe in the Redfern end of Bourke St that beckons with charm. We were regulars during a work exhibition for In Design nearby in Sydney. 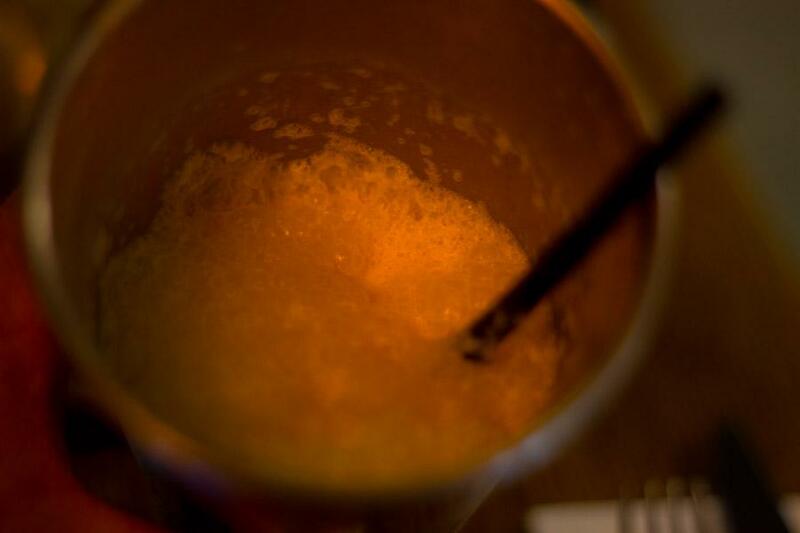 Sorry, our photos are quite grungy themselves. Breakfast here includes smashed Avocado and Corn fritters, Sour Cherry French toast and Baked beans. St Jude features concrete floor, white walls and large chunky communal table with stools. Or sit around at surrounding tables. The building itself has a certain charm. 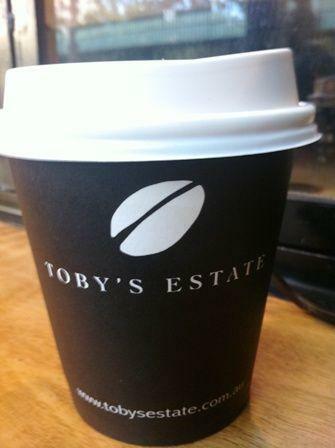 Coffee is premium and boutique from choice roasters and is served in chic blue cups (shown above). We found the service to be attentive and engaging. St Jude's is a welcoming cafe that had us returning every morning. Campos raises the bar on excellence and consistency. Everything at Campos is a resounding triumph. The coffee was one of the best I’d had for a while. The cafe latte has great crema with nutty characteristics. Love both the strength and complexity of the coffee. 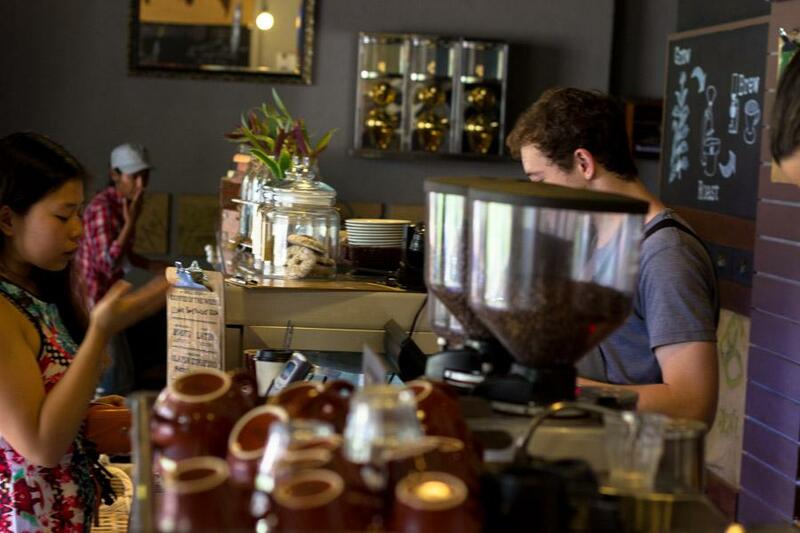 With Slayer, siphon bar, cold drip and La Marzocco weaponry, these highly skilled baristas have all the hardware one could ever need for coffee bliss. The staff are knowledgeable and super friendly! I was impressed to be so warmly engaged when I entered Campos and then the connection continued throughout. Bourke St Bakery is an iconic bakery and cafe institution in Sydney with perennial queues out the door. Sydneysiders can't get enough of this fare, baked fresh and with captivating gourmet allure. As you can see from the photo above this place hums - with now several cafes in the stable across Sydney. Lucy and James visited during a conference held nearby - and would love this to be our daily staple. "Paul Allam and David McGuinness began Bourke Street Bakery in the winter of 2004. Both were baker / chefs who shared a love of good food. Through the seasons Bourke Street Bakery has grown into a Sydney institution for people who have the same love affair. Bourke Street Bakery makes everything by hand with the best possible ingredients. A combination of great produce, artisanal skill and hard work creates the honest, soulful, delectable bites that Bourke Street Bakery has become famous for". Bourke St Bakery can be described as small and busy - more likely to get a table outside than inside. Or grab and go. Bourke St Bakery serves up pies with an extra dimension to the normal cuisine of most bakeries. How about Pork & Fennel Sausage Roll? Or Beef Brisket, Red Wine & Mushroom Pie? And the array of Pastries and Breads is stunning... I counted about 16 types of Sourdough alone. Bourke St Bakery also offer catering, cooking classes and functions services. Check out theirwebsite. The staff are friendly and busy. Lucien Kolff is the master here and oversees a serious coffee operation. Orders are taken and displayed for the barista on a computer screen such is the hectic demand. Love the fact they use decent milk in their coffee. Love the limited but tasty food options including frittatas and macaroons. Devon Cafe ticks all the boxes. 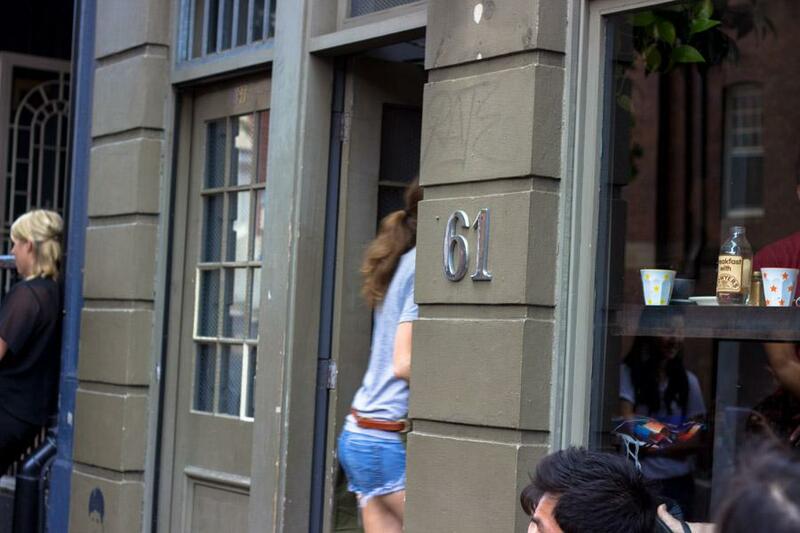 A chic, if unpretentious cafe on Devonshire St in Surry Hills is a tad nondescript. This is near the hurly burly of Central Station and is a humble precinct on a narrow street. Come here for top notch coffee served in vibrant red cups. Devon Cafe featured Industry Beans from Melbourne during our visit, a familiar coffee blend for us! Ambience is pleasant with large windows, sizeable communal table, quirky blackboards and great use of timber. Intimate, stylish and exciting menu options. Table service was impressive, with a steady traffic of take away coffee and quick counter food also popular. Devon Cafe pleases also with its weekday specials. Customers can look forward to stunning variations in th emenu and the talented chefs can display their craft. Slow roasted lamb for goodness' sake - where cafe meets fine dining. Devon Cafe served me the best breakfast I've had all year - the Breakfast with the Sakuma's. Japanese influences were to the fore with Miso grilled king salmon, smoke eel croquette, 63 degree egg, radish petit salad and kewpi mayonaisse. The balance of flavours was spectacular. Each element was to be celebrated. The generous portion of king salmon had miso nuances and subtle spices on top, and the eel croquette had delightful smoky flavours to match the clean hit of salmon. The runny 63 degree egg danced with the cacophony of texture and flavour. It just all worked brilliantly. Then the piquant salad was a triumph (for someone who doesn't rush to the salad bar). Everything about Paramount Coffee Project screams design and style. From the timber communal table to the fine blue cups. I can see the influence of Seven Seeds here in the chic design, being a frequenter of this cafe in Melbourne. Paramount Coffee Project is the place to meet. Next to me were a couple sorting out their relationship issues, for all and sundry to hear. Entertainment. 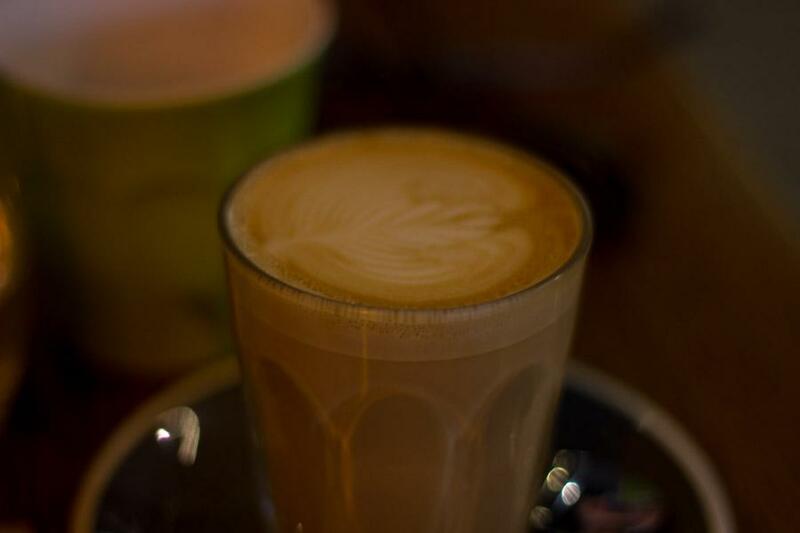 Like many top grade cafes the quality of the food is on a par with the quality of the specialty coffee. Choices abound from the popular Baked eggs with chorizo and cannelini beans, to Crab Po Boy, to my choice the delicious Elvis in Cuba. Elvis in Cuba. I think the great man would approve. This breakfast ticked all the boxes with pork, kimchi, bacon, kewpie, swiss cheese, and onion rings. But no peanut butter. The title would make some cringe as calorie overdrive, but this was no reckless fry up but an elegant well composed breakfast. And pretty to boot. As the rain kept falling and I didn't have an umbrella it was time to sample more specialty coffee. Quirky delights abound here including Caramel Popcorn Milkshakes and a Mini chocolate Magnum bathed in espresso. Coffee die hards love this place. Surely one of the best cafes in Sydney.